WATER STREET PARTNERS recently hosted our 8th annual JV CEO Roundtable at our offices in Washington, DC. We are privileged to regularly convene the world’s only network of JV leaders and felt especially so this year because we are celebrating our ten-year anniversary. We count a few of the participating CEOs among our earliest clients and are humbled by both their ongoing support and willingness to share their deep experience with others in the network. Fifteen executives from 14 JV companies attended the Roundtable. Collectively, these JV companies employ over 10,000 people and generate billions of dollars in annual revenues. Their shareholders, including Boeing, Humana, IQVIA, Chevron, Royal Bank of Canada, Bank of America, Shell Oil Company, Walgreens, Pitney Bowes, Continental AG, are some of the largest and best-known companies in the world. An important part of the job for the 15 executives in the room is figuring out how to leverage the strengths of their companies’ shareholders while managing the “tax” imposed when shareholders are not perfectly aligned on their vision for the JV. Much of the day’s discussion related to keeping shareholders aligned, and, after we finished our breakfast pastries and refilled our coffee cups, we were treated to a presentation from the CEO of a six-party technology JV about how he worked with his shareholders to transform the company’s sales models, technology offerings, and target markets. We then shifted to a discussion of JV performance (vs. wholly-owned or controlled businesses) and the correlation between performance and governance effectiveness. We closed as we always do – with an opportunity for each CEO to tap into the collective expertise of the group. We call it advice hour. His view is that you need all five factors in place in order for shareholders to agree to meaningful changes to strategy, scope, etc. In his case, it took the company over a decade to put the first four factors in place. He had the fifth from the beginning, as the JV recruited a respected industry veteran with deep Board expertise to be its first (and, so far only) independent Chairman. The next move the company made, a year later, was to bring its solution offering to a market vertical within a similarly highly regulated industry as the one it which it then worked. This natural step out was relatively low risk, but it was critical to the company’s transition from a captive “utility” existing to serve its owners to a “quasi-market” facing company with an appetite for growth. Two years later, the company cemented its position in the new market vertical by bringing on a sixth owner, which is a leading company in the new industry it serves. This was a big win for the JV, as it not only enabled it to gain scale, access new capabilities, and support future funding needs, but also announced to the market its ambitions within the industry and gave the management team an opportunity to show the Board it could execute a complex transaction. After six years of growth that nearly doubled the company’s size, the company faced another inflection point. The CEO said he’s now looking again at strategy, talent, culture, etc., while re-investing in the core technology platform and developing new IP. His goal is to position the company within the next year or two to transition to a market-facing model where the six owners benefit as much from the JV’s P&L as they do from its ability to deliver against their core needs. At that point, the company will be on the cusp of its 20th anniversary, and on a path that the original deal architects would likely have not guessed possible. We published a study late last year that challenged the conventional wisdom that JVs deliver worse returns than wholly-owned and controlled businesses. Our analysis of U.S. Department of Commerce (DOC) data, collected from more than 20,000 entities, shows foreign joint ventures of U.S. companies realized a 5.5 percent average return on assets (ROA), while those companies’ wholly-owned and controlled affiliates realized a slightly lower 5.2 percent ROA. The same story holds true for investments by foreign companies in the U.S., but the difference is more pronounced. U.S.-based joint ventures realized a 2.2 percent average ROA, while wholly-owned and controlled affiliates in the U.S. only realized a 0.7 percent ROA. Please click here for more information about the study. The CEOs in the room were not surprised by the findings. JVs are a good way to enter new geographic markets at lower risk than go-alone strategies. Pair that strategic rationale with an effective governance system and JVs like the ones in the DOC data set (i.e., foreign partner with a local partner) should deliver strong results. But what does an effective governance system look like? We used Water Street’s JV Governance Standards, which are organized around nine dimensions and composed of some 150+ practices, to answer that critical question. 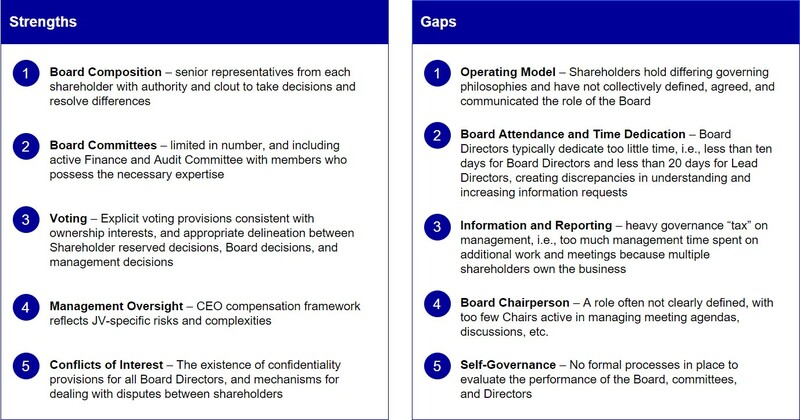 We presented five standards that JVs tend to perform well on, including Board composition and Board committee structure, and five standards that JVs tend to perform poorly on, including shareholder alignment on governing philosophy and evaluation of governance performance (Exhibit 1). CEOs agreed that too few of their Boards have defined expectations for the Board itself, and that it is the rare Board that annually reviews its performance against expectations. Many CEOs committed to (re)introducing the idea of a regular governance assessment to their Board Chair. We have written before that we hear from JV CEOs that the job can be lonely. Few peers appreciate the challenge of having two or more owners that have to agree on all important decisions, e.g., changing authorized scope, conducting M&A, seeking bank financing, approving the annual operating plan and budget. The peer-to-peer discussion held at each JV CEO Roundtable is the rare opportunity for JV CEOs to discuss their most difficult challenges with an audience they cannot find elsewhere – their fellow JV CEOs. Here is what some of the CEOs in the room had on their minds. 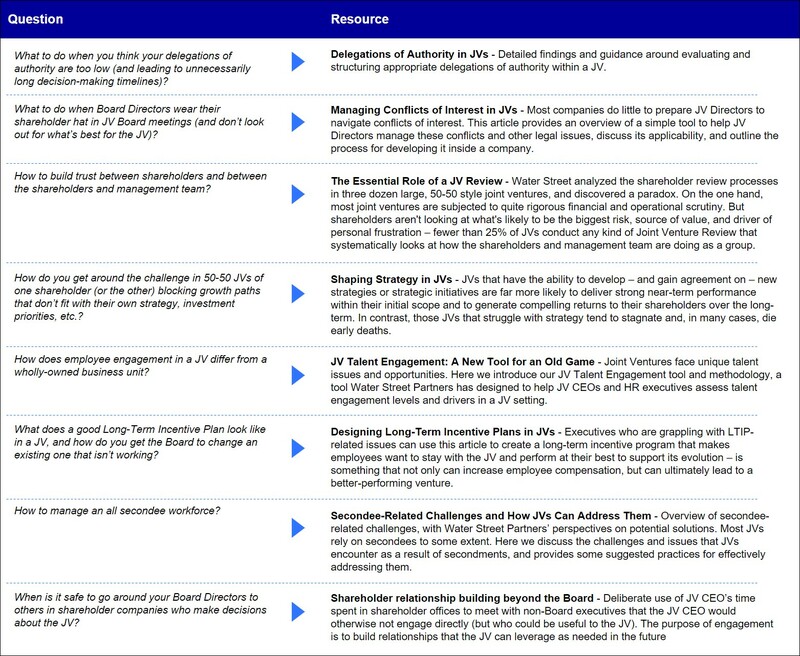 In case you too are wrestling with one (or more) of these questions, we include links to relevant resources available to our JV Advisory Group members (Exhibit 2). If you are looking for answers from peers who understand what it takes to succeed in a JV, we hope that you will join our next JV CEO Roundtable. Peter joined Water Street Partners in 2010, and is one of our partners. Peter is responsible for building and managing relationships with joint venture executives, Board members, and dealmakers. He has supported more than 100 clients across all phases of the partnership lifecycle, including deal negotiation and structuring, implementation, and ongoing management and governance.